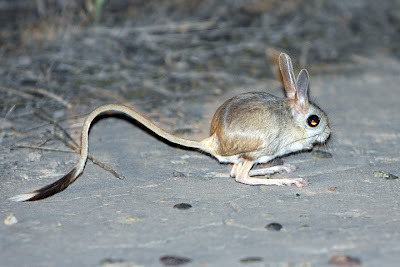 Small five-toed jerboa Allactaga elater, from Montarano Nature Photography. The Dipodidae include the jerboas of Africa and Asia. These desert-dwelling rodents are bipedal jumpers, with greatly enlongate hind limbs and shortened front limbs. In many species, the metatarsals of the hind foot are fused to form a single cannon bone, and the hind toes are reduced in number. [DW04] Deng T., Wang X., Ni X. & Liu L. 2004. Sequence of the Cenozoic mammalian faunas of the Linxia Basin in Gansu, China. Acta Geologica Sinica (English Edition) 78 (1): 8-14. [T66] Tristram, H. B. 1866. Report on the mammals of Palestine. Proceedings of the Zoological Society of London 1866: 84-93.